Nourishes and protects the skin from the ultra-violate rays of the sun and pollutants in the air. It minimizes pores and creates a dewy, never oily finish. It is Aloe Vera based, and contains DMAE, Alpha Lipoic Acid, C Ester and glycolic acid. In clinical studies these ingredients have been shown to reduce lines and wrinkles by 66% and noticeably firm and tone skin in 30 days of use. Other natural ingredients include Jojoba oil, Squalane, Collagen, Comfrey extract, Sage extract, Lemon extract, Ivy extract, Carrageenan extract, Cucumber extract, Panthenol (vitamin B-5), Allantoin, and Grapeseed Oil. This combination of herbal extracts and anti-oxidant vitamins rebuilds, nourishes and protects the skin from the ultra-violate rays of the sun and pollutants in the air. A wonderful primer for any make up. It may be used for all skin types. It minimizes pores and creates a dewy, never oily finish. Wear it alone or under your favorite foundation. Make-up goes on smooth and stays fresh all day! It is Aloe Vera based, and contains DMAE, Alpha Lipoic Acid, C Ester and glycolic acid. These anti-aging ingredients have been shown to firm sagging skin and improve texture and elasticity in the skin with extended use. 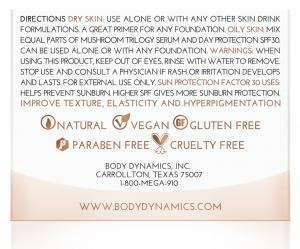 It contains no artificial colors or fragrances. It contains Butylene Glycol and Hydrocotyl extract. 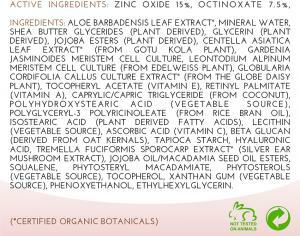 These are patented ingredients derived from Echinacea and gotu kola. In clinical studies these ingredients have been shown to reduce lines and wrinkles by 66% and noticeably firm and tone skin in 30 days of use. Skin texture, suppleness, and over-all look and feel continue to improve with continued use. 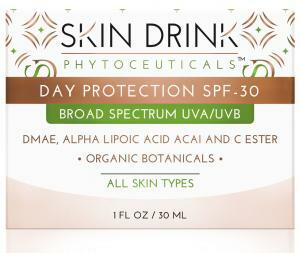 This formula may be used alone or in conjunction with the other Skin Drink formulas.